Every year Mumbai’s celebration of Ganesh Chaturthi hits national headlines across the country. Ganesh Puja is the biggest festival of Maharashtra, and the grandest celebration in Mumbai. Though Mumbai wins the crowning glory of being the largest hub of Ganesh Puja in India, Hyderabad does not lag behind. Hyderabad’s biggest Ganesh idol at Khairatabad is the only answer to Mumbai’s boast of Ganesh Festival. 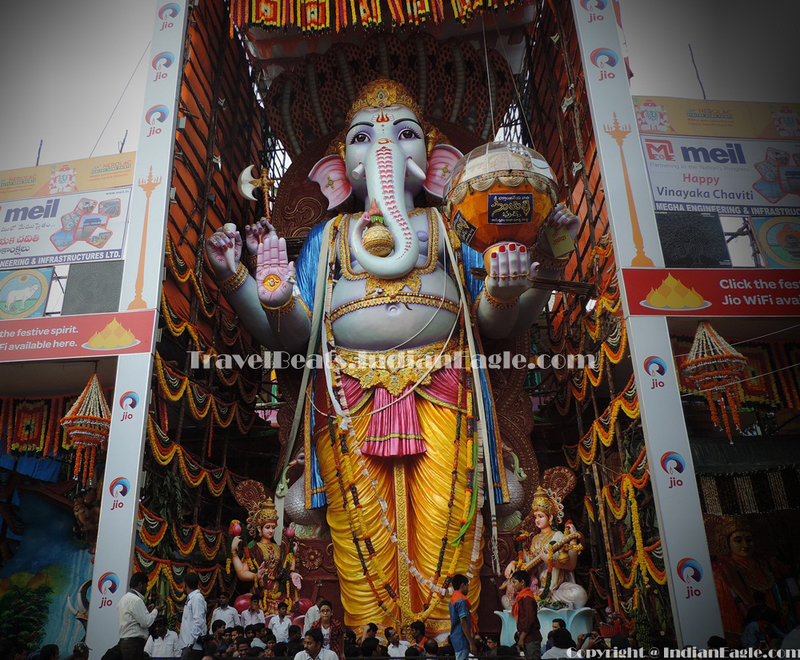 The idol of the “Khairatabad Ganesh” is of 60 feet in height. One of the most interesting facts about this Ganesh Puja in Hyderabad is that a laddu weighing 5600 kg is placed on the left hand of the deity during the festivity. Sounds incredible! Yes, but it’s true. Late Mr. S. Sankarayya, who was a freedom fighter, had initiated the “Khairatabad Ganesh” puja in 1954. Since then, it has been the grandest Ganesh Utsav in Hyderabad City. The 60-feet tall idol is worshiped for 11 days. The massive 5600kg laddu is auctioned for 10 to 12 lakh INR on the eleventh day. The lump sum from the auction of the Maha Laddu goes to a charitable fund. Indian Eagle books the cheapest flights to Mumbai and Hyderabad from the United States. Airfares to India from USA are as incredible as the stories of India, at Indian Eagle.